At a news conference at the Johnson Space Center in Texas, NASA announced the astronauts assigned to crew the first flight tests and missions of commercial spaceflight launches, aboard the Boeing CST-100 Starliner and SpaceX Crew Dragon spacecraft, from Cape Canaveral, Florida, . Why it matters: These crew members will be the first American astronauts to launch to space aboard rockets made in America, from American soil since the U.S. retired the Space Shuttle in 2011. The big picture: Since 2011, NASA has relied on Russian Soyuz rockets to send its astronauts to the International Space Station. The new missions are part of NASA's Commercial Crew Program, which is comprised of partnerships with Boeing and SpaceX. The announcement marks a new era in American space exploration, in which the federal government relies on commercial space companies to launch its astronauts. "Space has transformed American life," said NASA administrator Jim Bridenstine in announcing the new NASA crews. "Our investment in American space exploration always pays back... multiple folds in terms of the human condition." "This is a big deal, and we want Americans to know that we're back, that we're flying American rockets with American astronauts from American soil." The details: NASA announced crews for two test flights, including the Boeing test flight crew and SpaceX flight test crew. It also revealed crews for the first missions to the Space Station aboard both Boeing and SpaceX spacecraft. "I couldn't be more excited to be a part of the NASA-Boeing team... It's gonna be a proud moment for America," said NASA astronaut Nicole Aunapu Mann, who is a F-18 test pilot and will conduct her first spaceflight aboard the first crewed test flight of the Boeing Starliner. NASA partnered with Boeing and SpaceX to develop the Starliner spacecraft to launch atop a United Launch Alliance Atlas V rocket and the Crew Dragon to launch atop SpaceX's Falcon 9 rocket. 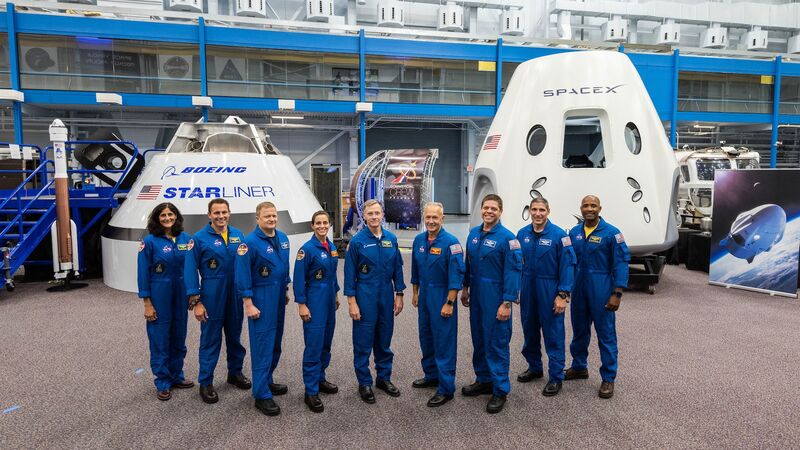 Boeing’s crew flight test is targeted to launch in mid-2019, and SpaceX’s demo mission 2 aboard its Crew Dragon spacecraft is targeted for launch in April 2019. Go deeper: Read more about NASA's Commercial Crew Program astronauts.